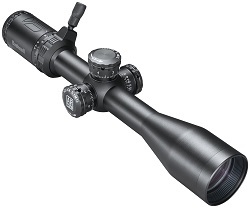 OVERLAND PARK, Kansas - April 18, 2018 - Bushnell, an industry leader in high-performance optics, has added to its top-selling line of AR Optics with several new options designed specifically for the Modern Sporting Rifle platform. The growing AR Optics line now has a scope specifically tailored for almost every prevalent caliber of today’s most popular rifle—including 22 LR, .223/5.56, .308 Win., .300 BLK, and even the red-hot 6.5 Creedmoor and .224 Valkyrie. The new lineup of AR Optics riflescopes boasts fully multi-coated optics throughout to deliver crisp images in every lighting condition. Custom BDC reticles purpose-built for each model allow precise elevation holds with today’s most popular calibers. Other features are model specific, including two options with illuminated reticles and four that boast robust 30mm tubes. In all, the AR Optics line now boasts 11 models in configurations from 1-4x24mm to 4.5-18x40mm with eight different optimized reticles. In addition, the AR Optics line is taking red dots to the next level. The new TRS-26 goes beyond its historic predecessor with longer battery life, a brighter, crisper dot and push-button operation - all in the same compact package. It features a 3 MOA dot with a 26mm tube body. The new First Strike 2.0 also features longer battery life with a small reflex-style ruggedized housing and 4 MOA red dot. Waterproof, fogproof and shock-proof the new TRS-26 and First Strike 2.0 offer adjustable brightness settings to perform in any weather and every lighting condition.